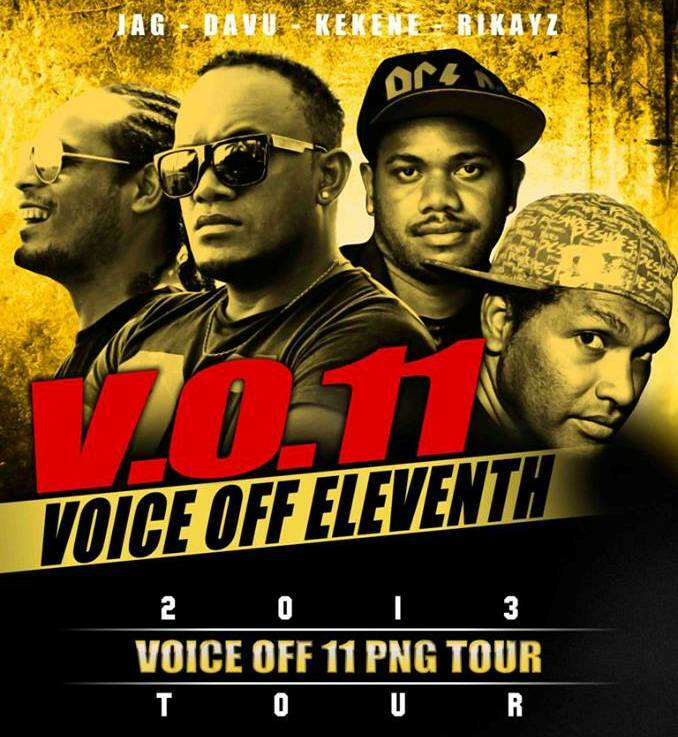 Young local talents will embark on a music tour Voice Off 11 PNG Tour in Port Moresby, Papua New Guinea on 17th -25th August 2013. This tour is part of a music development program designed by local promotions group, Events First, that helps young musicians who are talented yet are given little to no recognition for their passion. Behind these great talents are inspiring stories of how their music journey has brought them to where they are now. Brian Maesulia is a local household name, better known as JAG to his fans in Honiara, the capital of Solomon Islands. Music is Brian's gift, according to relatives, a legacy left behind by his paternal grandfather, an indigenous turned Christian in the highlands of Malaita Province who had skills in music that can only be acquired through formal education. Exposure to music started in church for Brian as a 3 year old toddler from children's ministries to church choirs then into church groups, becoming a congregation hit and favorite with his unique voice. As a young boy, Brian's first icon was Michael Jackson, spending hours in front of a mirror singing to his beats, never realizing the gift bursting in him to be recognized. Brian's shift out of the church scene came at the age of 16 when he joined in a high school competition and won the "Best Vocals" award. His voice not only knocked the crowd and judges, but it grabbed the attention of local home studios who offered to do recordings for free in recognition of his potential. His uniqueness continued to shine as he started working with other local artists, featuring in albums, most of it “doing it free for the love of music”. His down-to-earth personality makes him a favorite among studios, easy to work with when doing records. Punching voices isn’t his style, always does perfect takes and waves. His first single to hit the airwaves was "Looking for love" in 2004 - a blend of rock and reggae. It became an instant hit on the local charts and Brian became a music sensation and icon to young artists, dubbed Solomon Islands’ Bryan Adams. To this day, Brian’s singing talent and unique voice continues to be the talk of the town among locals and expatriates alike, a “…blasting voice that can keep music lovers on their toes; but he now needs a big platform to become the voice of the people … beyond Solomon Islands.” (Shiv Raj Bhatt, Advisor, Ministry of Foreign Affairs & External Trade, Solomon Islands). Skilled in playing the guitar, bass and keyboard, Brian developed his music through time and enjoys exploring different genres, any style thrown his way. In the studio or live on stage, Brian connects with his songs and music is "…my best escapism to fill in the gap". His skills are not limited to music, Brian is a self-learner to being a proficient graphic designer and works for Solomon Islands’ only television organization, One Television, as Director in the commercial department. He also does video editing of adverts and video clips of local artists. David Auna started his musical journey at an early age in church but only seriously embarked music as a career in 2005. For David, or Davu as he is referred to in the local music scene, music is not just about writing songs and making tunes but “a voice to express opinions”. Writing songs for Davu is an expression of situations in life: personal struggles, family, friends are just few angles of what motivates him to put together songs that are meaningful and has weight. For one who rarely speaks loud in a crowd, Davu is only able to translate feelings into words when he is working on a song. He however finds “writing for female a challenge, possibly could go back to my upbringing and background”. Davu’s approach in song writing is in general context and “it’s up to the listener to interpret its meaning to suit their situation”. Despite some music training in Malaysia and Australia, most of what Davu gives to the public is what he perceives as “all natural”. Putting aside the competitive nature in the music industry, Davu uses a combination of reggae in his music even though he has R’n’B qualities and voice that steers clear from the genre. His music elevated to higher grounds when he competed and won his first public competition, the 2008 Solo Icon. In 2011, Davu’s talent was again recognized in the highly competitive Voice Off Music Awards which he grabbed first runner-up position. Over the past 12 years of performing and being part of the music industry, his sole inspiration is older brother, Jonathan Auna – “my brother and mentor who is always there for me”. Always being able to put across a real good song with a voice likened to that of well-known international artist, R Kelly, the young man from Langalanga, Malaita Province is not just limited to singing and song writing, but also plays the drums, bass, keyboard and guitar – “one man band” – and choreographs dances for his clips. Davu appreciates music not just as a passion but “my safe haven that has brought me through challenging, hurtful and tough times when there’s no way out. I come out of my pits through music. I feel rest, a sense of freedom”. Not one to deter in hardship, Davu’s vision is fixed on going international, “…travel the world with my music”. Currently working on an album, Davu has performed alongside big names including Vanessa Quai (Vanuatu), Edou (New Caledonia), Naomi (Australia) and was supporting artist with Naio (Vanuatu) at the Fest Napuan (2008). Setting a trend in reggae-crazy nation of Solomon Islands is not an easy pick but for Rina Fiolo, his music shift is in the R’n’B grooves as it “goes with my voice”. Hailing from Fataleka, Malaita Province, Rina who is musically referred to as Rikayz started his music walk in his teens in church as a worship leader. He formed a band with fellow church brothers and they called themselves the “Kings Harp”. Rikayz turned to circular music and explored a blend of R’n’B, hip-hop and reggae for a unique combination. He formed Solkizs in 2007 and the band was managed by a Papua New Guinea (PNG) national. The band produced an album – “Stap wan taem” – in 2007 and in that same year scooped the PNG “South Pacific Artist of the Year” award. Solkizs later toured PNG in 2008 to promote the album. The emerging hot pick went through personal landslide with their manager’s untimely passing, and it was back to where Rikayz started – “struggling to keep my music dreams alive”. Solkizs picked up later in 2011 and worked on its second album after three years of finding themselves. The “Saratoga” album was sponsored by businessman, Peter Tam, which saw the launch in October 2011. But smooth sailing was a far cry for Solkizs in the new turn, so the decision to go solo was the only option for Rikayz who refers to music as his “bread and butter”. Going solo was not easy but “with help from Events First, it was a starting point that helped promote my name and also boost it.” In his own strive to build his solo image, Rikayz featured alongside other artists with big influence including Sharzy (Inde), which made it to number one spot in the local charts, Jahboy (Murderer) and JAG (In the Islands). Putting his singing skills to the test, Rikayz competed in the 2011 Voice Off Music Awards among stronger rivals and grabbed fourth place in a vigorous competition to secure a spot in the top five. Known for his cheeky charms and youthful enthusiasm, Rikayz uses his “signature smile” to connect with his audience easily and allows himself to get “lost in my songs” when on stage. With his blend of different styles, including island music, complemented with his “R’n’B voice”, Rikayz’s easy-going character is clearly distinctive. Jason Wesley, or Jaggah as he is best known among colleagues, friends and the local music industry, started an “unplanned musical journey” as a primary school student, singing in classrooms when teachers are not around and gathering friends around the village in Buala, Isabel Province, to “entertain” other children using home-made ukulele. Classroom stints moved on to church choirs until a new passion was discovered in high school, programming music. Jaggah spent a lot of time “abusing the school chapel keyboard and sacrificing pocket money to buy batteries” to practice. This proved worthwhile as keyboard skills emerged within the determined young man, and programming became “an easy task”. The passion developed into a driving need to “test the grounds” and his first break was helping an emerging girl band from the village, “Siuli”, programming music for 5 albums. Hard work and dedication was with little notice that the path taken was leading him to his musical destiny. Jaggah has always been deeply rooted to African music, a significant interest that strongly influences his style in music programming. With the demise of Suili, the search was on for singers interested in using tracks that were already available. Jaggah’s search only pointed back to himself when friends encouraged him to give singing a go and “that was my U-turn”. Jaggah was later approached to play gigs with once popular local band, Amrock Solid and Jaggah was instrumental in programming music for the band’s second album. The experience broadened his musical experience and prompted him to form his own group, Kekene, which launched its album “Soleana” in 2005 which was a huge success with its hit track “Milo milo”. In 2006, Jaggah scooped two PNG awards: “Song of the Year” for Milo milo and “South Pacific Artist of the Year”. Describing music as “an avenue to translate someone’s experience to put across what they want to say”, Jaggah maintains island style as his “music reference point”. This keeps his music consistent in style and “it is my musical signature that listeners pick up easily even if I’m programming for someone else”. Apart from singing, Jaggah plays the keyboard, guitar, choreographs dances to popular African tunes including (late) Lucky Dube, O’yaba. Juggling music and a formal career with the national broadcaster, Solomon Islands Broadcasting Corporation (SIBC) sales department, Jaggah refers to music and singing as escapism after a hard day, bringing out “the happy person in me and music is indirectly my mouthpiece to express my inner thoughts”. An optimistic young man, Jaggah strives to uplift the island music genre to the world market, to reach all four corners of the globe. With a local music industry that is struggling to make ends meet, Jaggah believes that “in order to reach the promise land, one has to first go through the wilderness”. In his contribution towards music development in the country, Jaggah is a key player and the brains behind the initiatives of hosting the first Solo Music Awards, Super 10 Music Show, Top 5 Bands of the Month and the High School Musical Battle.